ActioNet collected clean, gently used Clothing as part of the Veterans of America Clothing Drive. Clothing of all shapes and sizes are welcome. 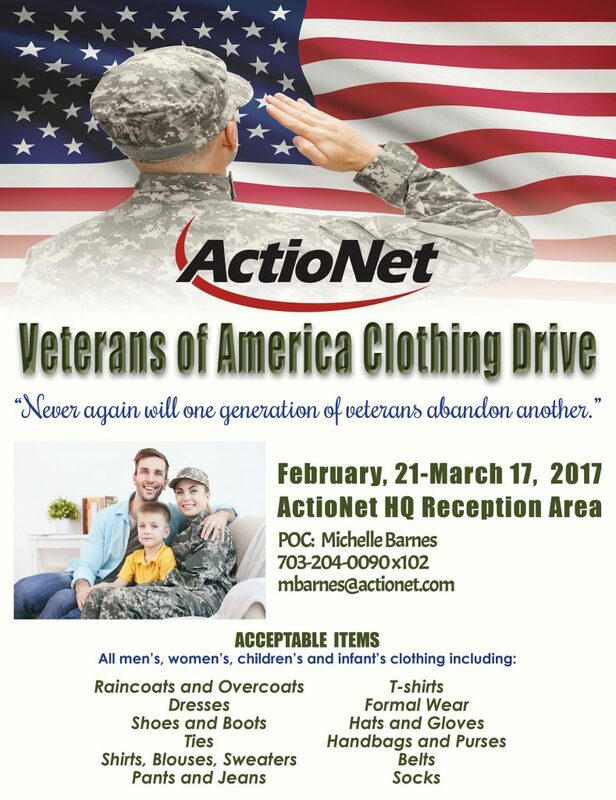 Veterans of America Clothing Drive is dedicated to distributing reusable coats, free of charge, directly to local Veterans of America. This was a great opportunity to help those in need right here in our communities during the Spring season. By donating used clothes, shoes, books, and accessories, you help generate funds to take care of the soldiers and service men and women who help keep America safe from harm. Veterans of America sells your donated items to private companies by annual bid which generates the majority of the funding to support the local, state, and national programs of Veterans of America.